ItemMBP-079 - A streetscape. Honduras, ca 1985. ItemMBP-081 - Bruce Cockburn writing in a book at a bar of restaurant. Honduras, ca. 1985. ItemMBP-082 - A Chevrolet truck in front of Kikes Dry Cleaning. Honduras, ca. 1985. ItemMBP-084 - Cafeteria la Amistad. Honduras, ca. 1985. ItemMBP-085 - Fixing a flat tire on a land cruiser. Honduras, ca. 1985. 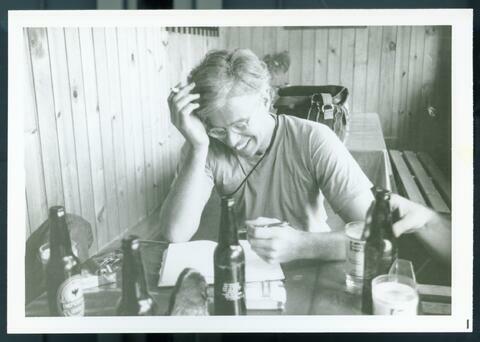 Item MBP-081 - Bruce Cockburn writing in a book at a bar of restaurant. Honduras, ca. 1985. Bruce Cockburn writing in a book at a bar of restaurant. Honduras, ca. 1985.